You are here: Home / Insurance / Buying Insurance by just comparing premiums? You may be in for trouble. Buying Insurance by just comparing premiums? You may be in for trouble. Are you planning on buying insurance of any kind? Are you going to simply compare premiums of various companies online and then buy? You may be making a big mistake. Insurance is important and we all know it. But what is more important is buying the right kind of insurance. So how we do it? Most of us compare various policies and with internet being omnipresent it is so much easier to do it. But what do we compare? Do we compare policy features, claim settlement ratios, riders etc? No! We compare premiums and more often than not assume that rest of the policies are the same while some offer certain features here and there, but premiums matter to us. But this is wrong. 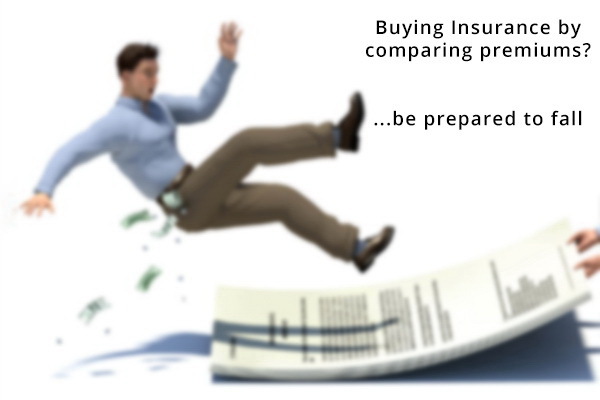 Never ever buy insurance by merely comparing premiums and don’t blindly go for the cheapest policies. Insurance is something that is long term and will matter when a certain unfortunate event takes place. At this time, your ‘cheapest’ policy may not give you what it promised or at times your claim may be rejected outright due to certain fine prints that you never bothered to look at since you were busy focussing only on the premium payments. You will regret your decision if you just choose policies based on its frills and especially lower premium rates. The sad part is that a lot of ‘relationship managers’ or ‘insurance advisors’ of companies that sell these plans also make sure they hit you with their sales pitch centred around the premium amount and they often highlight this by assuring you why their ‘premiums’ are the lowest. But they aren’t wrong in what they do. Why? Because, it is we who are so focussed and sold out on the ‘cheapest’ premiums on insurance policies that we often neglect the important aspects, which are policy details and more importantly the company’s track record with claim settlements. Buying insurance by comparing premiums is a wrong thing to do and it can very well haunt you when the actual need arises. When you buy a policy from any company for any reason the most important factor that you should consider first is the claim settlement track record of the company. The thing to understand is that insurance is a matter of covering yourself or your loved ones in case of any unfortunate event happening, like death in case of life insurance, theft in case of house-holder’s insurance, hospitalization under mediclaim and so on. At these points when you will need to make a claim, chances are you will already be under some sort of stress. You surely do not want to increase those stress levels by having to argue with the insurance company while making your claims. The other factor is their customer care or after sales so to speak. If a provider is offering cheap premium policies, but is lazy in their response after the policy is in effect, then it is not good either as for every small updates or information on your policy, you will have to run after them and keep following up. To further assert the point, there are a lot of plans by LIC of India, whose premiums are way higher than those of the private players, especially term plans. However, LIC has the highest claim settlement record; close to 98%, and hence there is public’s trust in this company. According to IRDA, LIC has the highest claim settlement ratio than any other private insurance provider, even when the premiums for LIC were on the higher side in some cases. It doesn’t mean that private players are bad and one should only stick to LIC. But the point is that mere comparing of premiums and settling for cheaper ones is not the way to buy insurance, even if this is how it’s advertised these days. Compare the policy details, and then check the company’s claim settlement track record and what benefits it offers, and then buy an insurance policy. Please avoid merely buying insurance based on premiums. A few bucks saved in premiums, can prove to be too costly when the insurance need arises and you make your claim. Be careful and avoid falling in this trap. Have you bought a policy by merely comparing premiums? Share your views below.